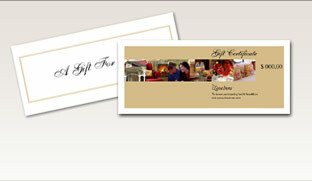 On the following pages you will personalize your gift certificate and choose delivery and payment options. All payments are securely processed by Authorize.Net �. We do not store credit card numbers. Once you hit the confirm button you are done! You will be shown and e-mailed confirmation numbers in order to access you gift certificate balance. Certificates will be shipped the following business day from when your order is placed. There is a $2.95 processing fee for Standard US Mail and UPS delivered certificates. Gift certificates are valid for use 7 days after purchase date. The certificate activation date is printed on the certificate. There are no expiration or blackout dates.